The Hyde Park Lane Villas are set within the Hyde Park Lane Bungalows resort complex of Puerto Del Carmen on the island of Lanzarote, just 300m from the beach and 4km from the nearest airport. 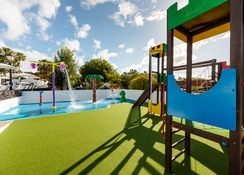 The reception is found within the Hyde Park Lane Bungalows (sister complex) and guests staying within the Villas will use all the facilities of Hyde Park Lane Bungalows such as four outdoor swimming pools, children’s pool, children’s play space, sun terraces, grocery store, net access, bar and terrace. Set in sprawling 30,000 m² of lush gardens, this property is just minutes’ walk from the beach. 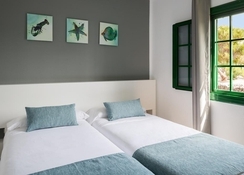 The architecture of charming white bungalows with terraces stands out in the greenery and the hotel is good choice to have a fun-filled beach holiday in sizzling Puerto Del Carmen. 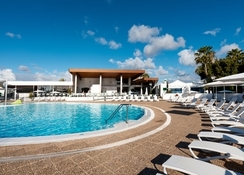 The Hyde Park Lane Villas are placed within the common resort of Puerto Del Carmen on the island of Lanzarote. This small and charming property is simply 300 metres from the beach, a couple of kilometres from the resort centre and enjoys a calm setting away from the hustle and bustle. Please note the Villas are in an annexe to the Hyde Park Lane Bungalows. From the popular Los Pocillos Beach, Hyde Park Lane is a 5-minute walk. Lanzarote Airport is 6km, barely ten minutes’ drive away. Each guest room, suite or villa features an en-suite bathroom with a shower and hairdryer, a bedchamber with single or double beds and a safe, a living room with a desk, TV with satellite channels and USB port, telephone, air con and heating and free Wi-Fi. The kitchen is equipped with a fridge, kitchen appliances, sink, microwave, utensils and two stoves. There is a furnished terrace providing amazing views of the pool or the garden. The ground floor residences come with barbecue. The guestrooms are available in one-bedroom, two-bedroom, one-bedroom adapted suite, studio, two-bedroom villa and villa deluxe categories. 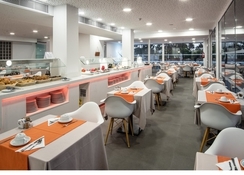 The Hyde Park Lane Villas has several eateries where you can find the local cuisine of the island and a large and varied menu of international dishes. Guests can have a buffet breakfast and dinner within the Hyde Park’s restaurant, while the poolside bar serves cocktails during the evenings. There's a supermarket at the hotel where you'll get groceries. The Hyde Park Lane Villas have four outdoor swimming pools and children’s pool where all members of a family may have splashtastic fun. The beach is just a pleasant stroll away, at 300m. The property incorporates a tennis court, four paddle tennis courts, mini discotheque and recreational show for adults is held in July and August. Bicycle and hire car may be rented at the reception. There's a spa equipped with steam bath, bathtub and ice baths, and a large choice of massages are available.